Bulk Container Packaging Market size was more than USD 2.5 billion in 2015 and is forecast to witness gains close to 10% CAGR by 2024. Increasing flexitank usage in bulk non-hazardous chemicals and food ingredients transportation is the major factor propelling the overall bulk container packaging market size over the projected timeframe. Flexitank offers value added advantages over other counterparts such as drums or barrels, ISO containers and intermediate bulk containers (IBC). High capacity ranging from 14,000 liters to 24,000 liters, low filling time and less number of operators required. In addition, it also requires very less installation and loading time. Flexitanks are suitable in transporting edible & animal oils, glycerin, wine, fruit concentrates, syrups, malts, food additives, paints and inks. 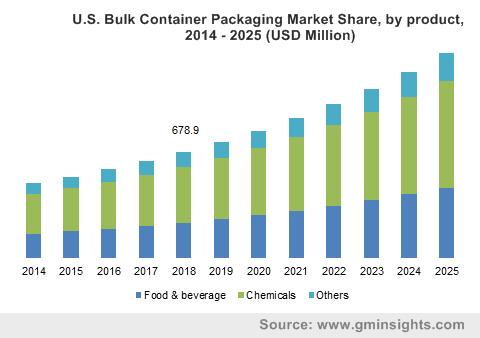 The aforementioned properties along with added advantage offered by the product such as high payloads, low weight, more space, low contamination risk and environment-friendliness will positively impact on the bulk container packaging market size by 2024. Bulk container liners, flexitanks, and flexible intermediate bulk container (FIBC) are mostly manufactured using petrochemical derived products such as polypropylene (PP) or polyethylene (PE), therefore the industry follows similar price dynamics. Oscillating petrochemical prices will subsequently hamper the bulk container packaging market price trends by 2024. For instance, the polyethylene price in 2010 was roughly around USD 0.71 per KG and reached USD 0.92 in 2011. Increasing oil, beverage such as wine, fruit juices and beer demand in BRIC nations will substantially propel the bulk container packaging market size over the forecast timeframe. For instance, total export commodities from China was roughly around USD 1.5 trillion in 2007 and market USD 2.5 trillion in 2013. This escalating will subsequently create growth avenues for the industry participants by 2024. Flexitank business generated revenue more than USD 150 million 2015 and will witness maximum gains over the estimated period. These tanks are suitable in transporting wine, fruit juices and edible oil. Increasing trade business of these products across the globe, particularly Southeast Asia, will significantly boost the bulk container packaging market size over the projected timeframe. Industry members involved in flexitank manufacturing have adopted new manufacturing technology in order to enhance the product characteristics. This will further complement business growth by 2024. Flexible intermediate bulk container (FIBC) accounted for the maximum share of the bulk container packaging market in 2015. The industry growth for this segment is mainly attributed to increasing product demand for transporting building materials, polymers, detergents and powdered non-hazardous chemicals. FIBC is available in a wide variety of conductive, antistatic, flame retardant and dissipative bags which serves a wide range of packaging applications. In addition, increasing industrial production and its efficient transportation will boost the business growth significantly by 2024. The overall bulk container packaging market share for food & beverage accounted more than 30% of the global industry size in 2015. Rapidly growing population has significantly propelled food product demand in large volume and at low cost. In addition, increasing consumer spending power towards food & beverage has substantially propelled tea, coffee, wine and beer demand across the globe. This drives the industry size in order to efficiently export/import foodgrade product without contamination. Bulk container packaging market share for chemicals is projected to expand at over 10% CAGR over the estimated timeframe. Increasing demand for transporting semi-finished products, lubricants, materials and minerals will propel industry growth. In addition, drifting chemical manufacturer focus towards setting up their manufacturing facilities in Asia Pacific on account of easy raw material availability, favoring government policies and low operational cost has increased chemical trade to meet the increasing chemicals demand across the globe. These factors will positively impact on the bulk container packaging market size over the estimated period. North America led the overall bulk container packaging market size in 2015. The regional growth is primarily driven by increasing corn, oilseeds, grains such as soybean, and feeds from the U.S. For instance, one third of the total agricultural land in the U.S accounts particularly for exports. The region is also involved in exporting beverage (wine & beer) across the globe in large volume. This results in propelling the regional industry share in the coming years. Asia Pacific bulk container packaging market size will witness highest growth close to 11% over the estimated period. Increasing population in China and India has substantially propelled the overall food & beverage import. Therefore, the growth rate in the region will be comparatively higher. Upgrading consumer lifestyles in Asia Pacific countries, particularly due to increasing consumer disposable income has increased the fruit juices, wine, beer and coffee demand. These foodgrade items essentially requires the product, and thus results in driving the regional business by 2024. Bulk container packaging market share was highly consolidated in 2015, with three major industry members accounting for more than half of the overall share. Some of the product manufacturers are BLT Flexitank Industrial Co. Ltd., Shandong Anthente New Materials Technology, Braid Logistics, KriCon, Büscherhoff Spezialverpackung, Environmental Packaging Technologies, K Tank Supply Limited, Qingdao LAF Packaging, MY Flexitank (MYF), SIA Flexitanks, Trust Flexitanks, Qingdao LAF Packaging, and Trust Flexitanks. Major product manufacturers including BLT Flexitanks have presence across multiple stages of the industry ecosystem, which enhances their presence across the globe. In addition, various product manufacturers are involved in product packaging product with superior characteristics, which allows easy product transportation without contamination. Rising edible oil exports from Southeast Asia and growing bulk wine trade globally will boost global bulk container packaging market size by 2024. Moreover, higher performance levels in terms of cost and operations of flexitanks over other substitute products available in the industry will further complement industry growth over the projected timeframe. However, wavering crude oil prices trends may hamper the bulk container packaging market size by 2024, as the industry follows the similar price trends. Based on the product, flexitank will be the fastest growing segment by 2024, on account of its superior traits as compared the prevailing counterparts in the industry. Regionally, North America accounted for the maximum share in 2015 due to its enormous foodgrade trade business spread across the globe.